Dept. 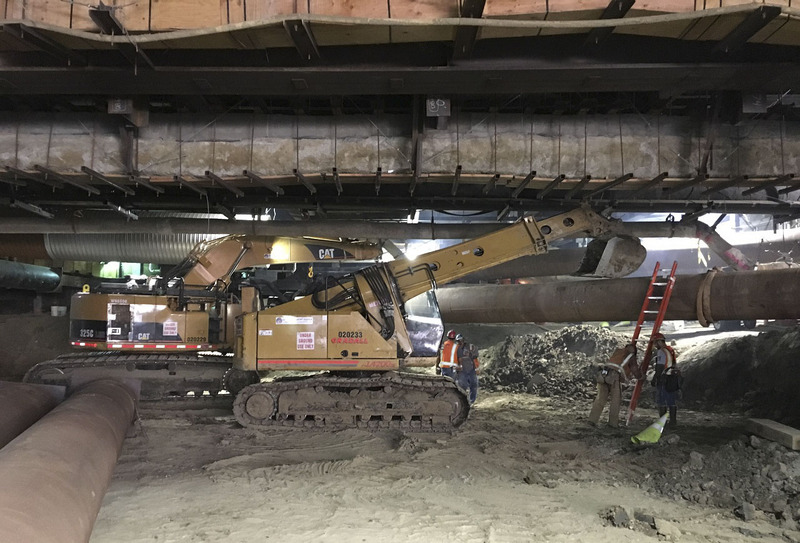 of Construction: a few pics below that just rolled in from the Purple Line Extension project. Excavation at Wilshire/La Cienega Station. 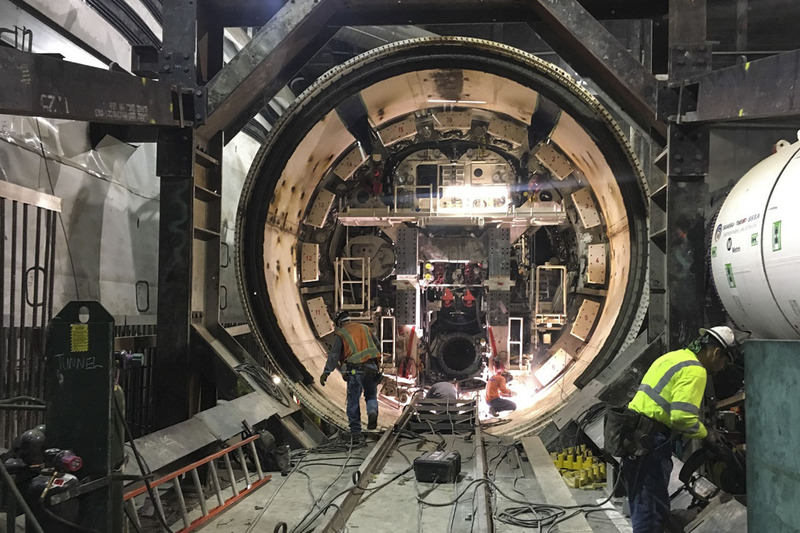 Lowering the TBM into final launch position at Wilshire/La Brea. 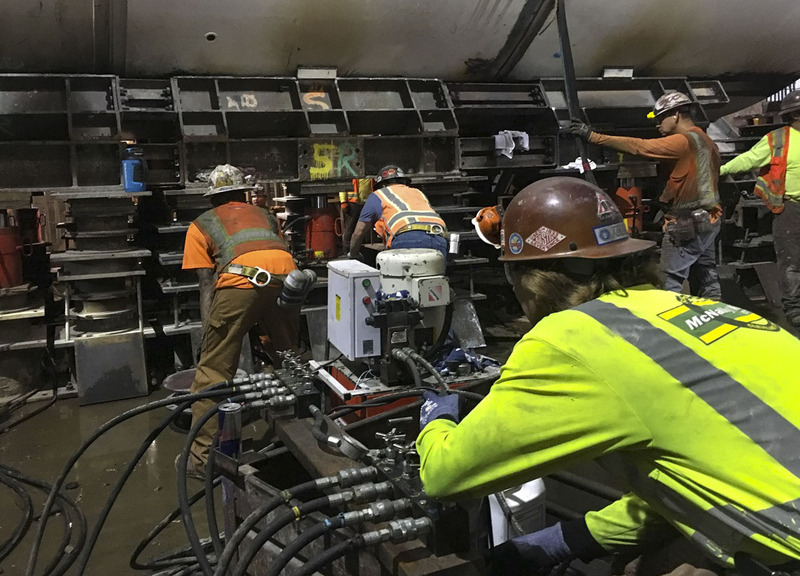 Welding the tunneling machine’s parts together at Wilshire/La Brea. Tunneling is scheduled to begin next month. Meanwhile, over on the Crenshaw/LAX Line, restoration work on Crenshaw Boulevard continues above the underground section of the line with the work moving north to the area around the future Martin Luther King, Jr. Station. Dept. of Dodger Stadium Express: the Giants are coming to town beginning tonight and the NL West looks to be a good three-way race between the Dodgers, D-Backs and Rockies, with the losers maybe not making the playoffs. More here on Metro’s free bus service to the ballpark from Union Station and Harbor Gateway. 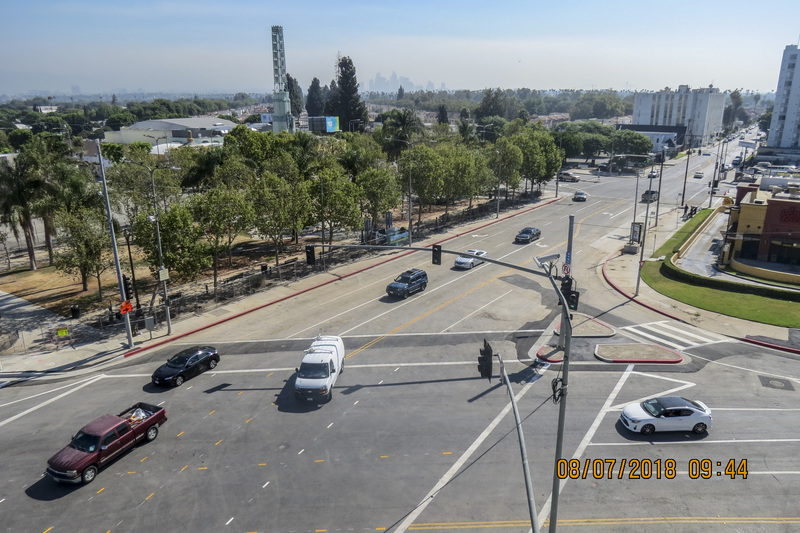 Also, the private aerial tram proposal between Union Station and Dodger Stadium made to Metro continues to work its way through the agency’s unsolicited proposal process. On Friday, Metro sent its “RFI” — Request for Information — back to the private firm that wants to build the tramway. Stay tuned. The first article concerns a recent legislative hearing in Sacramento. The second article — published earlier this summer — is the more important one and focuses on why officials pushed for a 2 hour, 40 minute run time between L.A. and S.F. when the $9.95-billion bullet train bond measure went to voters in 2008. The answer: bullet train officials thought if it a running time wasn’t cemented in law, it would be eroded by financial, NIMBY and other compromises over time. I get it, but what we’re left with is a hugely ambitious project that is vastly underfunded. And speed requirements don’t help as more speed = more $s. And this, which I’ve written before: sure the 2:40 time may make the bullet train competitive with flying. But I think that’s beside the point. A train that can beat driving would likely be very popular up and down the state. If I could leave DTLA and be in S.F. in five hours on a very comfortable train, I’d take it. Lots of scooter news this summer. The city of L.A. is looking at speed limits while the city of SaMo is looking at other companies — ones owned by Lyft and Uber — besides the popular Birds. At least the city of SaMo has a big bike lane network. In much of the rest of So Cal, the issue will remain: the electric scooters are popular and seemingly a good first/last mile device. But where should they be ridden? One of the nation’s largest transit systems has canceled 20 or more trains daily over parts of the summer — and there’s no quick fix to some of the staffing shortages. Maybe renting Lamborghinis to tourists isn’t such a great idea. The speeding fines — the car was caught going 150 mph — total more than $47,000 bucks in the U.S. The 2014 FRA study differentiates between those who trespass on rail lines and those who plan to take their own lives. “Reducing the overall number of individuals who attempt suicide by all means will likely result in a decrease in suicides on the railroad rights-of-way,” the study says. Speaking of the Chili Peppers (art of transit) I just can’t stop reading articles about transportation funding. Bullet train would have been faster and cheaper if it didn’t have to route through Fresno. Now it will not only be slower, it’ll have to make a few stops in Central California and they will need to dig tunnels through the mountains. A straight shot along the 5 Freeway should have been the better choice, but Politics!!! I suggest they save money by connecting to San Francisco first. There’s more need in San Francisco and they already have a well established BART system. The SF commuters will benefit from buying housing outside the SF area. The ultimate goal of going direct from LA to SF is no longer feasible. Instead, just design it as city to city commuter train. Fresno is the largest city in the country not served by the interstate highway system. With a population of a half million, the bullet train has to go there. No it doesnt fresno is the sole reason there is delays in that segment of the line. I wish we had completely skipped that part of the state. The HSR route thru Fresno, etc, was selected to maximize ridership. Also, not all HSR trains will stop at Fresno and other intermediate cities. There will be overtake tracks at selected location to allow express trians to bypass locals. This makes the HSR a lie to begin with. High Speed Rail is defined by the Railway Gods as trains traveling at least 200 kph (125 mph) or faster. The world speed record for “normal” high speed rail (using two rails) is over 357 mph–that’s MPH–held by France! (I asked the driver why he stopped at such an odd speed. He said he could have gone faster but he had run out of track!) The bigger picture, for me, is the fact that the US is one of maybe only two countries that still use the archaic British system of measure–MPH–instead of the metric KPH. (I think the other country that uses mph is LIberia–no not Norway.) So, it is no surprise to me that many in the US still want to turn their backs on HSR, since we are possibly the most BACKWARD of all so-called First World Countries. That mindset, I think is the real reason we still are fighting over CAHSR. How does HSR ever makes sense in the LA to SF route? No one is asking for this rail line and voters are already regretting it. It was never a city pair that makes sense especially in California. The routes that do make sense is LA to San Diego or Las Vegas, or SF to San Jose or Sacramento. Then again, once you’re there, you can’t get around so you still need a car. The only place that does need HSR is the Northeast corridor. There’s no such project linking New York to other highly populated cities. America is really behind in population density compared with Japan and Europe. If you wish a mass transit solution, have more dense development. It’s time to rezone all the residential areas for high rises and mixed development. It’s not BACKWARD to acknowledge there’s no business case for HSR until the population density catches up to how they are in Japan and Europe. HSR should be recast as a solution to SF’s housing crisis so more commuters can afford to live 2 hours outside of the city and as far as Fresno. A quick computer check will reveal that LA-SF is the second busiest air route in the country. So yes, there is a market for CAHSR. The Northeast Corridor, centered on New York, may not get state-of-the-art high speed trains in the lifetime of anyone reading this because, unlike CAHSR, the NEC right-of-way is hemmed-in by wall-to-wall development that surrounds a narrow and curving loading gauge that was first laid-out during the Dawn of the Railway Age–1830 in AMERICA (and 1825 in the UK, where train travel was invented.) How can folks get around after the plane lands, the train pulls-in, or the ferry docks in LA or SF? Just like they do in Chicago… by riding “El” trains, subway trains, commute trains, trolleys, buses, rental cars, taxis, Ubers, bicycles and, yes, even scooters. If that does not work for some, then they should consider jobs and/or housing that is near these modes. Consider this, as well, when my Dad was too old to drive, he was amazed how much money he saved riding taxis over buying a car and paying for insurance and maintenance. Moreover, he enjoyed the pleasure of watching the changing view whilst the taximan drove! Do I think that METRO spends too much on gilt-edged projects instead of basics like bus shelters, yes. Do I think that top METRO management is on a self-serving political and bureaucratic gravy train, yes. But, do I think public transit, including CAHSR, is one of the best ideas to come down the pike since the wheel was invented–definitely! “Rome wasn’t built in a day.” It took about 500 years to build Rome and another 500 years for it to end. The Interstate Highway System began in 1957 and it is still being built and rebuilt and rebuilt. I predict that when the CAHSR is finished it will take considerably less time. The CAHSR was not routed thru the I-5 Grapevine Route because of the following: it is one of the most earthquake prone locations in the state, the powerful Tejon Ranch Co. would have none of it, relatively no one lives on the I-5 Route and it would leave stranded the 6 million citizens of the eastern San Joaquin Valley with only rickety Route 99 to use. Nor is there any reasonable air service in the SJV, since the airline industry was deregulated by various Republican Administrations starting with California’s “Golden Boy” Ronald Reagan. (BTW, the same RR closed the state mental hospitals to save some bucks at the cost of countless homeless folks living in the streets.) There is a strong “Buy American” lobby that prevented the simple import of off-the-shelf European, Chinese and/or Japanese high speed trains–some dating back to the 1960s. The lobby is even stronger now, under Chairman Trump. If there is no CAHSR then we will need two more airports to cover our future North-South traffic and they are estimated to cost more than the CAHSR. Bringing Route 99 up to Interstate standards would also cost more money than the CAHSR. Indeed, with the cost of tunneling through the mountains, the CAHSR may terminate for the time being in Bakersfield–“Bakersburg” in railroad jargon). Thus making the SJV a bedroom colony–with affordable housing–to Silicon Valley and the SF Bay Area. Thus Los Angeles will eventually lose influence in the state as a whole because of its dependency on gas, bad real estate schemes (a tradition), air pollution, intractable highway traffic and now extremely hot Summers–due to climate change–to boot!. Take your pick of the above scenarios, but no Californian will get away without paying the piper for one travel mode or another. No wonder Nero torched it all! Looking at the Avelia Liberty on the east coast, its safe to say that California, especially Southern California, go bamboozled on this. There is no way possible anyone is going to ride a High Speed train in the 2030s. I just don’t see it happening. It would have been wiser to maybe look into upgrading service between SD and LA, a corridor that is heavily traveled and would have made for commuting between the two cities. Id gladly buy a monthly pass for work if the LOSSAN corridor was High Speed today. Still believe LA – Bakersfield should have been built first. While you were then building north of Bakersfield, the current San Joaquin trains could have been running direct to LA. Yes, different equipment (Talgo). That way if never else ever got build, you have at least connected north and south rail wise in the state. I also still think I-5 is better- only one mountain range, rather than going over Techachipi and then the San Gabriels. If Japan can build in a fault zone, we should be able to also. Too many lobbyists, consultants, politicians got involved and lack of common sense departed. Most high-speed rail systems were built segment-by-segment over decades, with trains using regular-speed tracks to get to places that the high-speed network hadn’t reached; end-to-end trip times would go down bit by bit, as each new high-speed segment opened. This was not an option for California for two reasons: (1) high-speed trains can’t use regular-speed tracks because these are not electrified, and (2) trains from the north can’t reach L.A. because passenger trains not allowed through the Tehachapi pass. The sensible way to build high-speed rail would have been to tackle these two problems first (in opposite order): fix the Bakersfield-Lancaster gap, allowing 8-hour through service on diesel trains, then electrify the entire existing line, which would probably entail improvements that would cut down the end-to-end trip time to about 6 hours. After that, build high-speed tracks segment-by-segment as funding allows. The advantage of the above plan is that people get a useful service early on, which helps build support for more public investment. My guess is that closing the gap and electrifying the line would have been achievable within the original 10-year, $10-billion time frame, but this less ambitious (but far more realistic) plan might not have gotten the votes. but HSR should go to other cities, its kind of the whole point. If you want a direct, short trip, take a plane. LA to SD is indeed where the massive demand for phase one service was and is, but California politics are controlled by NorCal democrats, and they demanded norcal to socal be the phase one service. their argument was that the entire state would never vote for an HSR system whose phase one was only in SoCal (the implicit threat being they would actively campaign against a measure that did LA to SD first). In nocal you have caltrain and in socal u have metrolink HSR was ment to connect both while updating infustructure.